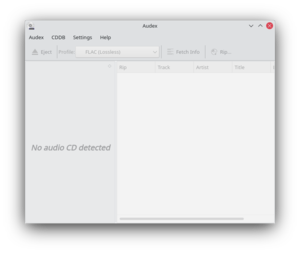 '''Audex''' is an easy to use audio CD ripping application. In general usage of '''Audex''' is self-explanatory. With the first start '''Audex''' scans your system for common encoders and creates a common set of profiles automatically for you. If you rip an audio CD from the artist "Metallica" and the album name is "Metallica", the files will be stored in the folder /Metallica/Metallica within your base path you set in the general settings. If the folder does not exist, Audex will create it for you. If you rip an audio CD from the artist "Metallica" and the album name is "Metallica", the files will be stored in the folder /Metallica/Metallica within your base path you set in the general settings. If the folder does not exist, '''Audex''' will create it for you. The CD number of a multi-CD album. Often compilations consist of several CDs. Note: If the multi-CD flag is not set for the current CD, than this value will be just empty.